How much power am I going to use? The Bluebird is outfitted with a Goal Zero Yeti 1250 and two 100W Boulder solar panels. That’s 1250 Wh, enough to power a generic household 100 W bulb for 12.5 hours, or enough to power the 1.5 W LED lights in the van for much, much longer. The all-in-one generator, inverter, and battery has plugs for AC 120 V, DC 12 V, and 5 V USB. The display also shows your input and output power so you always know what to expect. In case you need to power up on a cloudy day, you can plug into shore power at 120 V or into the van’s primary battery at 12 V as you drive. For your personal lighting needs, you have plenty of options. The main lights are good for full illumination, but you can opt for a kitchen light, a bedtime reading light, and also LED strip party lights. These last ones can change color, and can even dance to your music. Here are the appliances you may be using, and their approximate power usage. Is there a tow hitch? The Bluebird is wired for a tow hitch, but we have not yet installed it. We wanted to leave that up to you – the buyer – based on your needs. We wanted to leave this one up to you – the buyer. In our personal travels, we find it quite easy to find showers to use, either at yoga studios, at work, or at friend’s homes. If you desire a more reliable shower situation, there are a bunch of different options, and all are easy to add into the Bluebird (we are happy to help you through this one when you make a decision). We believe the best option may be a thermal tank outfitted to your roof rack. Roadshower.com makes a wonderful product, ranging in price between $299.95-$499.95 depending on how many gallons you want. We also looked into a DIY version of this, which would be more economical, using a black PVC pipe. We also left space in the back for a spare tank, and you could add in a water heater in theory. These may be more difficult to work in, but there are lots of options, and always a way to make it happen. There are also options for a water battery powered portable camping showers that charge up from your USB plug. We like this one by Pure Clean for only $29.99. These are not heated, but they get the job done! For an even less expensive but slightly heated option, the old reliable camp shower bag which gets heated by the sun during the day, and are normally only about $10-$15. We are not directly financing through us but we have had success in the past working with LightStream. Everything is done online, making it simple and easy, they offer low rates, and don’t require liens. Is the Bluebird RWD or 4×4? The Bluebird is RWD. After many conversations before purchasing we found there are no problems driving in snow and other conditions with RWD. Colorado Mountain Express (CME), a transportation company in Colorado that frequently tackles storms and icey passes, for example, uses only RWD in their vehicles. After driving all winter for skiing adventures, we have had no problems driving in snow. We did carry chains just in case, but never had to use them. Why are you selling? 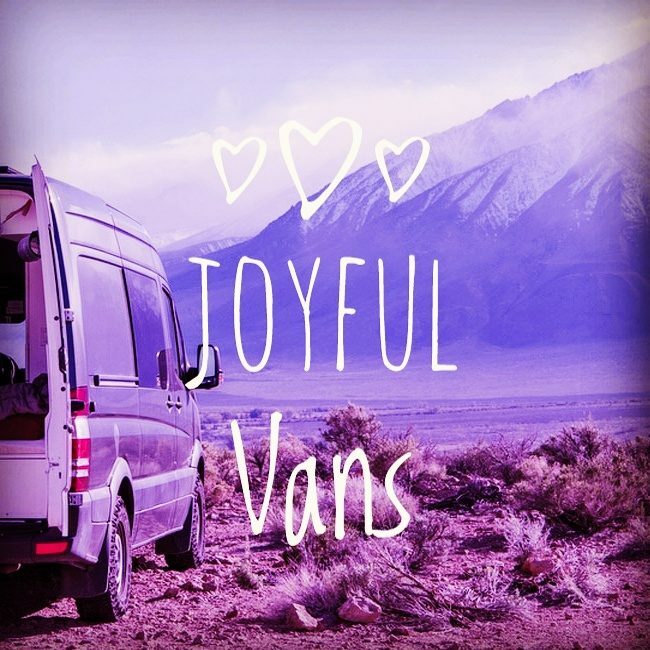 Are you over the #vanlife? We LOVE living and traveling in a van! We love it so much, we want to do it for a living. We want to continue building and keep the creative wheels turning, so we need to sell the Bluebird to begin our next conversion. I have a van/bus – can you build it out for me? We would love to work with you to turn your dream into a reality! Please contact us so we can begin a conversation about possibly building now or into the future. I am pretty tall – will the Bluebird work for me? Standing Up Straight If you want to stand up straight in the Bluebird, it maxes out at about 6’2″. We have installed a lot of insulation mostly on the ceiling and walls, but on the floor as well. If we were to build a custom van just for you, we would likely cut out all of the floor insulation (not so important) and possibly a bit of the ceiling (most important for insulation) to help it better accommodate your height. There are also taller van options, so again it comes down to customizing it just for you! 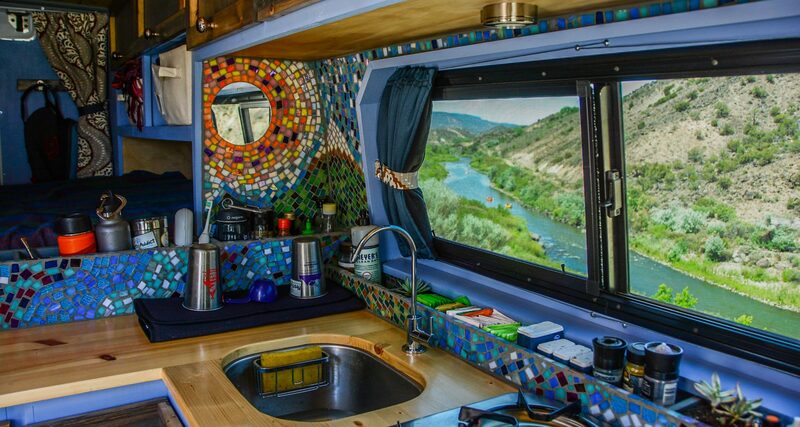 The Bed The bed in the Bluebird sleeps across the van to save space for the kitchen and living space, and is an RV Queen, so it measures at 60″x72″ rather than the usual queen at 60″x80″. Some taller, single van dwellers choose to orient the bed like this and sleep a bit diagonally, but that gets to be more difficult if you have a significant other. If you are over 5’10” and a couple, we may not recommend the Bluebird, but we are happy to let you check it out for yourself. We have ideas for future builds on how to better accommodate taller individuals, so please don’t hesitate to contact us about a build that is perfect for you!